Let Dental Implants Restore Your Smile. From gum disease and decay to backyard football accidents, there are myriad reasons why a person can be missing a tooth. An estimated 69% of Americans age 35-44 are missing at least one tooth. While it may be tempting to leave the gap and not replace the missing tooth, this can lead to a variety of dental problems. The best solution is to have Boise Dentist Scott Wright and the team at Centennial Dental Center replace your missing tooth with a dental implant. Dental implants provide a long-term solution, often lasting the remainder of the patient’s life. They also function exactly like a natural tooth, allowing you to eat anything you want without worry. To learn more about Dental Implants, contact our Boise Office at 208-322-1112. Dental implants are the anchor that is placed in the jaw and is just one part of the prosthetic tooth replacement. 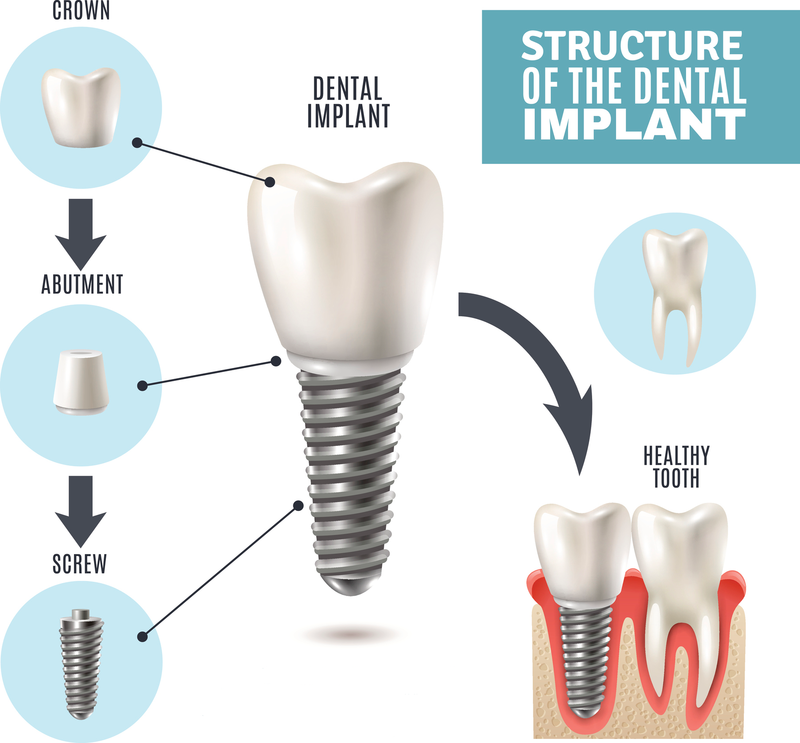 What many people think of as dental implants consist of three sections: the implant, the abutment, and the crown. The implant is made of titanium and is screwed down into the socket of the former tooth root. The jawbone then grows around the implant, fully making it a part of the jaw. Afterward, your dentist will place a post, also called the abutment, on the implant, and attach a crown (false tooth) to the post. For a patient to be able to have dental implants in Boise, ID, he or she must have sufficient jawbone mass to support the titanium implant. If the person has been missing the tooth or teeth for some time, there is a good chance that there has been some deterioration of the jawbone. There may not be enough structural jawbone to adequately support the implant. In these cases, jawbone grafts will be necessary to grow new bone mass before an implant can be placed. Otherwise, just about any adult of any age can have an implant. The patient’s jawbone must be fully developed when placing an implant, hence the “adult” requirement. Why Should I Have an Implant to Replace my Missing Tooth? Bite Alignment Issues – The teeth surrounding the missing tooth no longer have pressure on them to stay in place, so they slide over into the gap. This movement can change your bite and overall alignment. Jaw Bone Deterioration – When you chew or bite, the tooth takes the energy and transfers it down the tooth into the jawbone beneath. This energy signals the jawbone to build new bone mass, keeping it healthy. When a tooth is missing, that energy doesn’t enter the jawbone, and it begins to deteriorate, which leads to a sunken appearance in the area as the jawbone collapses inward. Nutritional Issues – A missing molar can keep a person from eating certain foods, due to the difficulty in chewing them. This can lead to nutritional issues. What are the Benefits of Having a Dental Implant? Implants are load-bearing teeth, so you don’t have to avoid chewing or biting with them. Plus, they transfer energy down into the jawbone just as natural teeth do. This keeps the jawbone healthy. Implants have a 90 to 95% success rate and can last for decades (often the remainder of the patient’s life) giving the patient back his or her smile and the ability to eat any foods. The permanence of a dental implant depends on the jawbone mass. If there is sufficient jawbone mass, the implant is screwed down into the hole left from the former tooth root, and the jawbone then grows around the implant, fully integrating it into the jaw. Dr. Wright will make sure you have sufficient jawbone mass prior to placing the implant. If necessary, you may need some bone grafting to create sufficient jawbone mass. Why Would I Choose an Implant Over a Bridge? There are basically two options for replacing a missing tooth, a dental implant or a bridge. People sometimes opt for a bridge due to the lower initial cost and a shorter procedure length. But Dr. Wright thinks implants are the superior option for his Boise patients. Once placed, a dental implant behaves exactly like a natural tooth. The patient can eat any foods without worrying about the bite strength. Bite force transfers down into the jawbone, as it does with a natural tooth. This doesn’t happen with a bridge. Plus, when placing a bridge the teeth on both sides of the missing tooth or teeth need to have crowns placed atop them to anchor the bridge. This involves shaving down some of the healthy top portion of the teeth to make room for the crowns. In contrast, implants don’t affect the adjacent teeth at all. And while a bridge may initially be cheaper, it will probably need to be replaced every 10 years or so, where an implant can last for decades. Contact our Office Today To Schedule Your Appointment Where We Can Address Any Questions or Concerns You May Have. Call our Boise Office at 208-322-1112 to Set up an Appointment Today! Dental implants are not inexpensive, but patients looking to replace a tooth need to consider the alternatives. Bridges can be used, but they generally last from 5-15 years and then will need to be replaced. Patients can opt to not replace a missing tooth, but then the adjacent teeth will slide into the gap creating problems with bite alignment and other issues. Dental implants are an involved procedure, as you’ve read about above. But once in place, a dental implant functions exactly like a natural tooth. You can eat whatever you want (including sticky, chewy foods), bite into hard foods — in other words, you will soon forget that you have an implant! Plus, most implants will last the remainder of the patient’s life, so one procedure is likely all you’ll need. The cost of an implant depends on the condition of your jawbone and gums. If Dr. Wright finds your jawbone, which may have deteriorated over time due to missing teeth, isn’t sufficient to anchor an implant, jawbone grafting may be necessary. There are variables involved, but Dr. Wright will discuss your implant options and costs after he gets a clearer picture of your unique situation. Most dental plans do not cover implants, although this is changing. Some companies are beginning to see the long-term advantages and are covering at least part of the cost. If your insurance company does not cover implants, you should ask if they will at least cover the cost of an alternative, such as a bridge, and apply that toward your implant procedure. Implant placement — After the patient is anesthetized, Dr. Wright drills a tiny hole into the socket of the former tooth root. He then screws the titanium implant down into that hole. Osseointegration — The second step is what makes a dental implant function just like a natural tooth. After the implant is screwed into the jawbone, time is allowed for the jawbone to grow around the implant, making it truly a part of the jaw. This process, called osseointegration, takes from three to six months. Attaching the post — Once osseointegration is complete, you return and Dr. Wright attaches a post, called an abutment, to the implant. Then, we again let your gums heal for approximately six more weeks. Attaching the false tooth — When your gums have healed, you’re ready for your dentist to attach the crown (false tooth) to the post. Dr. Wright uses only porcelain crowns in his practice, so it will beautifully match your surrounding teeth and provide unparalleled strength and durability. Once your crown is attached, there is no recovery time. You can go out and eat what you want and show the world your new, complete smile. 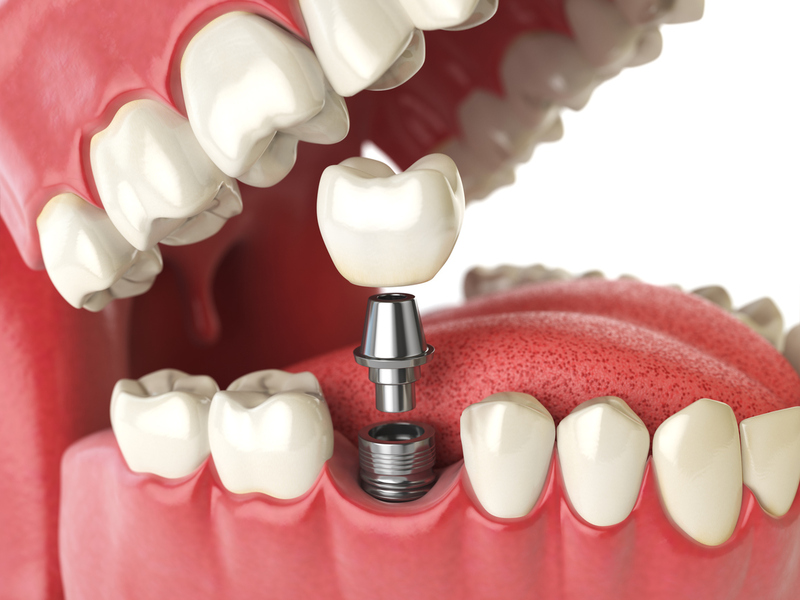 Most patients find that getting a dental implant is far easier than they assumed beforehand. As mentioned above, there will be some gum recovery and jaw soreness, but this is usually easily managed with non-prescription pain medication. Remember, the jawbone where the implant is placed does not have any pain-sensing nerves. An icepack will reduce any swelling, and you’ll eat soft foods for 10-14 days after each stage. There are two recovery periods. The first period will involve some slight swelling of the gums where the implant was inserted. This only lasts a couple of days. You may have some soreness in the jaw, cheeks, or chin area where the implant was inserted, but it is easily managed with over-the-counter ibuprofen. You’ll eat soft foods while your gums heal. The second recovery is when the post is placed onto the implant. This may occur with the first step or it may require a second step. There is a quick recovery with the gums, as they must be allowed to fully heal before placing the artificial tooth. This is not difficult, but takes a few weeks. Dental implants are made of a titanium screw that is placed down into the jawbone with an artificial tooth attached to the top of the implant base. Titanium is completely biocompatible, meaning your body will not try to reject it. In fact, your jawbone grows around the implant base, making it a part of the jaw. That’s why implants are so strong and function exactly like a natural tooth. The key to a good outcome with a dental implant procedure is the experience of the dentist. Dr. Wright has had a successful practice in Boise for over two decades and has placed countless implants over his career. Dental implants have improved the way we address tooth loss in adults. However, Dr. Wright does not recommend this treatment for young children. Successful implants require the integration of a small post into the jawbone. When the jaw is still growing, up until the teen years, there is a chance that an inserted implant will not be in the intended position. Dr. Wright believes implant treatment in Boise, ID is best after full jaw development. Will a False Tooth Look Just Like my Natural Teeth? Because we use porcelain crowns, your fake tooth will look just like your adjacent natural teeth. Porcelain and natural tooth enamel have similar characteristics in the way light shines off of them. No one will know which tooth is an implant; they will only know that you no longer have the gap in your teeth. If you are in Meridian, Boise, Eagle, or surrounding areas and are in need of a dental implant, fill out our contact form!